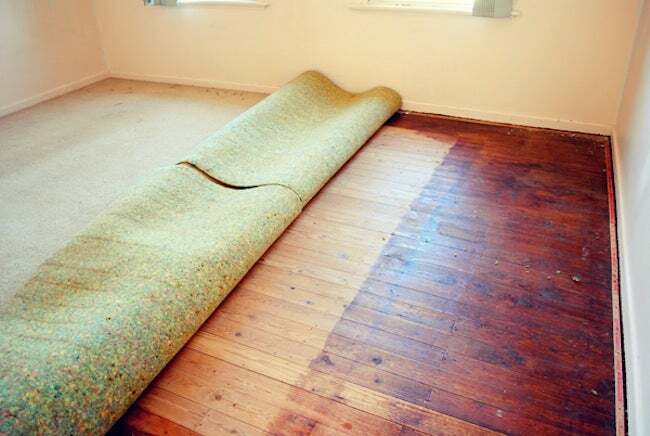 Pulling up old wall-to-wall carpeting can be a tough, dirty job for homeowners. Here are some helpful guidelines when undertaking the task. Pulling up old wall-to-wall carpeting can be a tough, dirty job. Start by getting all the furniture out of the room and giving the carpet a thorough vacuuming. Then open up some windows, put on a dust mask, and get to work. Pull up a corner of your carpet and padding to see what’s below. If it’s plywood or cement, grab a sharp utility knife and slice the entire carpet into three- or four-foot strips, cutting through the backing but stopping short of the floor. If you see hardwood, you’ll want to cut the strips with scissors or tin snips to avoid damaging the wood. Start pulling the carpet away from the tack strips on the perimeter. Roll up each section as you remove it and put it in a heavy-duty contractor bag. Once you’ve taken up the carpet, use a pry bar to pull up the tack strips. The tacks are sharp, so use work gloves, and for safe disposal, put the tack strips inside the discarded carpet rolls. Finally, take up the padding. If it was stapled into place, take out the staples using nail puller pliers. Use a putty knife to pry them up a little if necessary. If the padding was glued down, some heavy scraping may be required, or try an adhesive remover.